Throughout his career, British drummer Bill Bruford has played progressive rock (with Yes, Genesis, King Crimson) and jazz (with the electric Bruford and the acoustic Earthworks) with equal authority. On his new record labels, Summerfold and Winterfold, he showcases his jazzier output, supplementing the albums with an extra CD of interviews and audio samples. 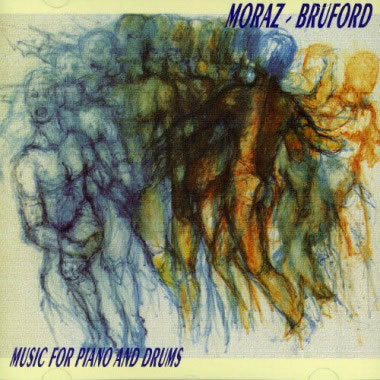 Bruford and Moraz reprise their duo on 1985’s Flags (Winterfold), an overproduced studio outing that has Moraz doubling on Kurzweil sampling synthesizer as well as playing a Steinway concert grand piano while Bruford alternates between acoustic and electronic drum kits. The album opens on a decidedly sour note with the bombastic, overproduced “Temples of Joy,” which sounds like the theme to an ’80s sitcom. Moraz’s classical/prog-rock pretensions spill over on other schlocky numbers such as “Karu,” “Impromptu, Too!” and the grandiose title track. A saving grace is Bruford’s heartfelt solo turn on Max Roach’s “The Drum Also Waltzes,” and the two acoustic-improv pieces, “Split Seconds” and “Infra Dig,” are also of interest.